Why don't fogbows appear on clouds? As far as I know clouds are lot of small droplets condensed in air. If droplets are large enough we see a rainbow. If they are small we see a fogbow. Although the size of the droplets are big enough for fogbows to form on cloud according to this link, I haven never seen a fogbow on clouds nor found a picture of it appearing on clouds only on fog. Why? As DWin points out in his comment, the angle you look from is crucial. To see any "-bow" (rainbow, fogbow, cloudbow, etc. ), you will generally need the sun to be at your back. The sun (or other significant light source) needs to be at your back because rainbows are caused by sunlight refracting through tiny spherical water droplets, reflecting off the back of the water droplets, and finally returning through the front of the droplets to be received by your eye. Once the light has exited its droplet, different wavelengths will be dispersed at different angles (like what happens when light passes through a prism). As a result, you will see different hues emitted by different portions of the mist because different ranges of the visible spectrum will reach you from droplets at different positions in the mist. Droplets at the same distance from you will produce the same color of light to your eye - that is why rainbows are circular or semicircular. Furthermore, rainbows will move along with you as you move because of the parallax effect of the sun. This webpage does a pretty good job of explaining it. So, to answer your question directly: to see a cloudbow, you need to be situated between the sun and the clouds with the clouds at just the right angle (otherwise, the optical phenomena will miss your eyes entirely). Achieving this with rain or fog (or in a plane) is not that difficult since much of your field of view is taken up by the water vapor. Consequently, the relative positions of the sun, the clouds, and you don't need to be very finely tuned to cause you to see a 'bow. Achieving the same result with clouds is much harder because (a) they subtend a smaller solid angle (and therefore require more precise positioning) and (b) they usually do not present themselves as a broad curtain of water vapor (so you will only get bits and pieces of the bow, not the whole arch). Moreover, because of the height that clouds are above the ground, achieving the necessary angle between you and the sun while you are standing on the ground can be very challenging. Dwin described rainbows below an observer, Geoffrey described the same phenomena with the sun behind the observer. However there is another angle at which a diffraction arc may form: Directly around the sun or moon. Every droplet causes dispersion. Thick collections of droplets are too dispersive to preserve the delicate phenomena of diffraction known as a rainbow, which is why most clouds are opaque and white. 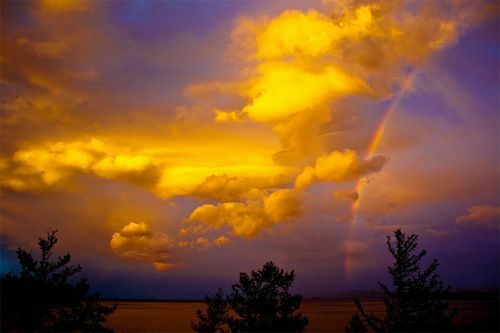 Clouds are generally either too thick or too thin and high in the atmosphere to have any significant probability of spanning any significant angle of a diffraction arc / rainbow. Sun dogs are what result when the length of the arc is too small. 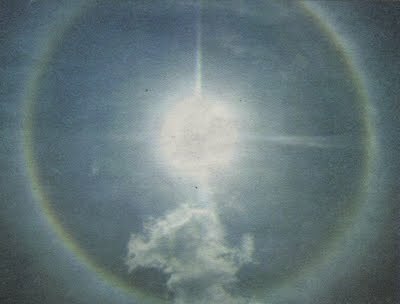 Only rarely occurring thin low-level clouds are likely to create a rainbow around the sun. However a ring a round the moon is actually more common: probably because of ultrathin highlevel clouds that are too thin to create a rainbow visible in the daytime. Not the answer you're looking for? Browse other questions tagged optics everyday-life refraction diffraction or ask your own question. Why do clouds appear black? Why is concrete dry around cracks? Rainbows at the surface of calm cold water : mechanism? What was the rainbow like object I saw in ice crystals this morning?